There are many ways of using remarketing to reach consumers across the content network who have a higher value to you than the average user. In this article I’ll examine how to set up a remarketing campaign, and then give you some ideas for how to implement this across your website and inside your AdWords account. 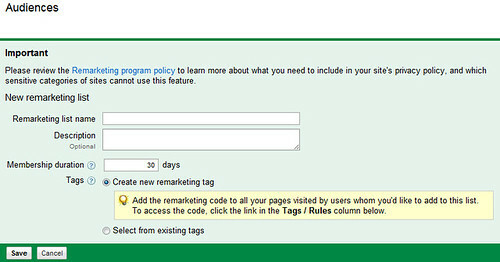 Setting up a remarketing campaign is very simple. It’s the execution of a remarketing campaign that can become quite complex. Let’s walk through each of the individual aspects of creating a remarketing ad. In the AdWords interface, click on “Control Panel and Library” that is located just below your campaign list in the right hand navigation. Next, click on the “audience” link in the right hand navigation. 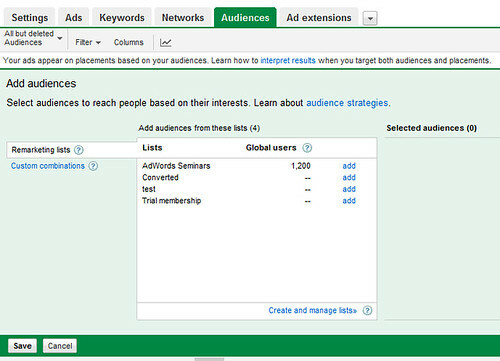 Once you have defined a few audiences you can then create custom lists. Custom lists allow you to create Boolean strings of who should be included in a list. For instance, you can include all people who entered your shopping cart but exclude everyone who bought something. Everyone who didn’t buy makes up a list of abandoned shopping cart individuals. If this seems overly complex to you, then skip it for now. You can use positive and negative audiences in your ad group to achieve similar results. Next, click on the tag for the audience you’ve created. This will open a popup box that contains a script. This script will be placed on the webpages that when someone visits you want included in that AdWords audience. For instance, you might have one tag that goes on a global footer. This will put all your website visitors in an audience. You might have another code that only goes on your conversion page—this will be a list of only those people who’ve converted. We will examine a few ways of setting up these codes further along in this article. Create a new ad group. This ad group must be in a campaign that is shown across the content network. In this ad group, you can include specific keywords and specify placements; however, for the sake of your sanity I would suggest not doing so when you first start. Google has two ways of showing content network ads: across all pages, or only on placements you target. Based upon those choices, the rules for placement and keyword targeting differ; you might inadvertently create ad groups that are shown to other people than those in your audiences. In addition, you can set bids at the ad group, placement or audience level. Bidding can become overly complex when an ad group contains many of these items. Once you are more comfortable with remarketing and audiences, then you can explore some highly customizable options for showing ads. First, add at least one audience to the ad group. In the same ad group, create your ads. You can use image, video or text ads. Whenever possible, use image or video ads that are easily recognizable as being part of your website. Not all content sites support image ads, so adding a text ad to that same ad group (or even duplicating the ad group so one group has images and one has text) is OK so you can bid based upon the ad type and audience combination. cart if you’d like to revisit them. Or, offer a discount: “Your shopping cart feels abandoned. Use code10 to receive 10% off all the items in your cart.” Be creative and test ads that are based upon someone having a basic understanding and knowledge of your website. You’re done. You are now running a remarketing campaign. It’s not difficult, but since you are reaching someone who has interacted with your website it is easier to customize the message for that audience and even make special landing pages for them. First, make an audience of everyone across the entire website. This code will go into a global footer. Next, make an audience of anyone who entered the shopping cart and this code will go on all of your shopping cart pages. Make a custom combination in the audiences tab. This will include everyone from the website visitor audience, but not include anyone who was in the shopping cart audience. Inside the ad group, add the visitor list as the positive audience. 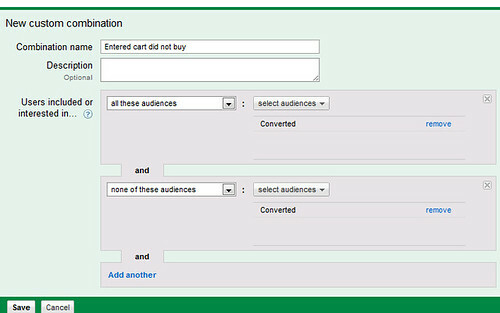 Then add the shopping cart (and buyers which is our next section) to the negative audience list. This ad group will have the lowest bid of our three ad groups. These consumers visited the site, but did not actually add anything to the cart so they also have the lowest potential of converting. Assuming this is the same account as the previous list of non-converters, you will already have two audiences: non-converters (or website visitors) and those who entered the shopping cart. What we do not yet have is a list of those who bought a product. Therefore, create a new audience called buyers. Then put this tag on the “thank you for shopping” page. Just as with the above section, remarketing to non-converters, you have two options for this next step. You can either create a custom combination of those who entered the shopping cart but did not buy, or you can add the shopping cart abandoners as a positive audience and buyers as the negative audience. Since these consumers added something to the shopping cart, they did start down the conversion funnel. Therefore, these visitors are usually worth more than just a website visitor. The bids for this ad group will be higher than the previous ad group. Your ads should be customized to talk to the consumer about coming back to your shopping cart. It could be a reminder that the items exist or a discount code if they return. Lifetime visitor values are essential to track. Just because someone bought from you once does not mean they will buy from you again. You can create remarketing campaigns aimed at selling something to your most valuable audience—your actual customers. If you have defined all of the audiences above, this is very simple. Create an ad group and then add the buyers audience as the positive audience. In your ads, remind them of your company and why they should come back and visit your again. If people do not usually buy from you again immediately after a purchase, but often wait a month before buying, you can even create a remarketing list that will not be displayed to these individuals for 30 days. First you have your buyers audience. Let’s assume you set this as a 30 day cookie (which is default). Next, create a second audience called “buyers a month later.” You will use the exact same tag to define this audience so you will not have to put another code on your website; however, in the cookie length set it to be ninety days. Then, create an ad group where the positive audience is “buyers a month later” and add the “buyers” as a negative audience. Someone who just bought will technically be in both lists. However, because you have the negative audience, these consumers will not see your ads for 30 days. Once the cookie has expired thirty days later, then they will no longer be in the negative audience. They will only be in the positive audience and can therefore see your ad. These are some basic examples. However, you can have a lot of fun with remarketing campaigns. If you can put a code on a page, you can define an audience. The only limitation is that remarketing audiences do not become live until there are five hundred active cookies. If you segment your audience with too small a sample, they may never become active. If you would like to read more, you can see how we set up some remarketing campaigns for one of our products that is subscription based. While many of these examples examine an ecommerce company, remarketing can be effective for service based industries as well. When you first create a remarketing audience and ad group, start with the basics, such as abandoned funnels. Test ads for each audience you are reaching. If you are remarketing to those who abandoned a funnel, and your remarketing campaigns are not working, you might test ads or examine your shopping cart before giving up on remarketing, as these are some of your most qualified visitors. Another advantage of remarketing is that it’s “agnostic”—it does not matter if visitors came through adCenter, twitter, FaceBook, or some other traffic source. Because they were on your site you can place a cookie and then target these consumers again. Once you have mastered the basics and tested remarketing ads then start defining some custom audiences to see if you can remarket with even more precision. Remarketing is powerful. The ability to serve an ad to someone who has actually interacted with your website in some fashion means you are serving an ad to someone who has a higher chance of converting than the average user.